The RNZIH are again joining the International Plant Propagators’ Society New Zealand (IPPS-NZ) conference for 2018. The conference will open on Thursday night at the Hotel Coachman in Palmerston North where Graham Smith, former Curator and Director of the Pukeiti Rhododendron Trust garden will deliver the 2018 Banks Memorial Lecture. The conference will have papers on growing superfoods, propagation technology, hybridisation, myrtle rust, kakabeak conservation, producing standard rhododendrons and more. There will be visits to well-known local nurseries including Plantlife Propagators, Kilmarnock Nurseries, Perssons Nurseries, Leafland Tree Nursery, Starter Plants, Sunshine Environmentals and Plant & Food Research. Friday night will be dress-up night at Central Energy Trust Arena with the theme of ‘Student Times – yesterday, today and tomorrow’ while Saturday night will be the formal dinner with auction and awards. Philip Smith is leading a pre-tour around some local nurseries and horticultural operations, departing the Hotel Coachman on 26th April at 8am, and arriving back at around 4pm. Numbers are limited to 30 so get in quick. Registration is now open to both RNZIH and IPPS-NZ members. The cut-off dates are: 15th Jan – 15th Feb = $350 early-bird; 16th Feb – 1st April = $395 regular; 2nd April – conference start = $450 late fees. See the IPPS New Zealand Region 2018 Conference page or contact Hayden Foulds (haydenfoulds@gmail.com) for further information. The RNZIH 2018 AGM will be held at the conference venue, followed by the 2018 RNZIH Awards and the Banks Memorial Lecture. Venue: Green Room, Hotel Coachman, 140 Fitzherbert Ave, Palmerston North 4410. Date: Thursday, 26 April 2018. 5.30–6.30pm – AGM followed by the award presentations (Green Room). 6.30–7.50pm – light dinner for all attending conference. 8.00–9.00pm – Banks Memorial Lecture (Hunterville Room). The Banks Memorial Lecture is a free lecture open to the public. It commemorates Sir Joseph Banks, botanist on Captain Cook's first voyage to New Zealand. During a later distinguished scientific career, he was Director of the Royal Botanic Gardens at Kew, London. Venue: Hunterville Room, Hotel Coachman, 140 Fitzherbert Ave, Palmerston North 4410. As a child I was always interested in the natural world around me and plants were part of that, being encouraged to garden by my parents. As one of the first apprentices in the Royal Parks of London and then a Diploma student at Kew my dream was just beginning – but I could not have envisaged where it would take me. Coming to New Zealand in 1968 the Kew connection brought me to the Pukeiti Rhododendron Trust in New Plymouth as Curator, the beginning of a my learning curve of rhododendrons and the New Zealand rainforest. During the next 39 years I developed contacts with rhododendron growers, collectors, botanists and national associations all around the world. I established a Registration Naming Authority for NZ hybrids through the NZ Rhododendron Association and made myself available to other international societies, speaking at their conferences about our work in New Zealand. I soon realised that taking enthusiasts with me creating enjoyable tours was a way of sharing the experiences and this became a regular occurrence. Countries visited included USA, Canada, UK, Holland, France, Italy, China, Australia, Malaysia and Papua New Guinea. During this time I was able to import or collect new plant material and introduce them to Pukeiti under the import regulations at that time. My aim through all of this was to make Pukeiti the best rhododendron garden in the world. I established the first public Vireya rhododendron collection in New Zealand and this has been enlarged four times to become the second largest in the world. In retirement I spent two years entering the Pukeiti rhododendron collection onto the BGBase botanical database system and then continued assisting new staff under the Taranaki Regional Councils ownership of Pukeiti. I also found time to co-write a book with Glyn Church and Pat Greenfield on the ‘Big Leaf Rhododendrons’, the first time this subject had been dealt with. An ongoing project cataloguing the ‘Gwavas Woodland Garden’ in Hawke's Bay with Alan Jellyman continues to challenge my broader plant knowledge and at the same time provides a working document for the future management of this unique collection. The Banks Lecture is an opportunity to show you something of my life's horticultural journey, which still continues. 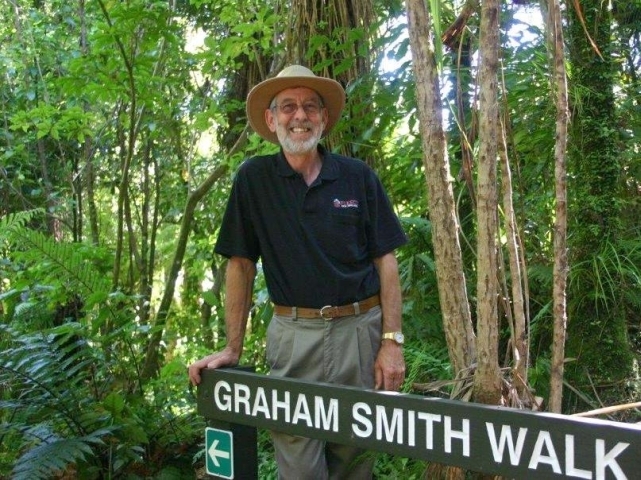 Graham Smith is former Curator and Director of the acclaimed Pukeiti Rhododendron Trust garden, an internationally recognised garden established in 1951 with one of the most diverse collections of rhododendrons on display anywhere in the world. Graham’s horticultural career began in the UK, with an apprenticeship in the Royal Parks, London, based at Regent’s Park for five years, and then gaining a Kew Diploma at Kew Gardens over the next three years. As a 24 year-old, Graham arrived in New Zealand in 1968 and originally planned to spend a two-year working holiday here. Within three months of arrival he was appointed as Curator of the Pukeiti Rhododendron Trust. He ended up serving at Pukeiti for 39 years before retiring as their Director in 2008. Graham remains an avid plantsman; he is still involved in Pukeiti and is also an assessor for the Taranaki Rhododendron Festival, having been involved in that since the concept stage more than 25 years ago.